Technology Acquisition Policy -The purpose of the Technology Acquisition policy is to establish guidelines for the acquisition of technology including hardware, software, computer-related components, and services purchased with enterprise funds. With the every increase in the technology devices, applications, and operating environments. The process to manage not only the acquisition but also the on-going maintenance costs and interface with the IT infrastructure and implication on the governance process are great. This is a necessary part of management control with a eye towards creativity. A major issue arose when several "events" occurred and scores of enterprises were faced with extended outages and tens of thousands of dollars were spent with little or no guidance as to how that was to be accomplished. All hardware, software, or components purchased with enterprise funds are the property of the enterprise. This also includes all items purchased using a personal credit card or other methods for which the employee is later reimbursed. 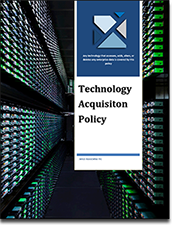 Technology Acquisition Policy is 9 pages in length. It contains everything that an enterprise needs to implement a functioning technology acquisition process. Included are forms defining the working environment in addition to a check list to validate that the off-site location complies with you safety requirements. This policy comes in MS WORD, PDF, and ePub (eReader) formats. All of Janco's Policies are delivered electronically. In addition, they are reviewed and updated frequently to meet the latest compliance and industry standards. This policy is also available as part of the IT Infrastructure Policy Bundle which can be acquired with 12 or 24 months of update subscription service.